A volley of frozen shards that do 70 points of damage, and twice as much Stamina damage. 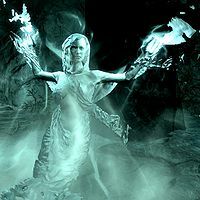 The Pale Lady is a named Wispmother that protects the Pale Blade in an underground forest within Frostmere Crypt. During the eponymous quest, the blade is taken by the leader of a group of bandits, Kyr, which leads to another of the bandits, Ra'jirr, hallucinating about the Pale Lady, stealing the sword and attempting to return it to the forest. "For generations, the people of Morthal have told whispered tales of the Pale Lady, a ghostly woman who wanders the northern marshes, forever seeking her lost daughter. Some say she steals children who wander astray, others that her sobbing wail strikes dead all those who hear it. But behind these tales may lie a kernel of truth, for ancient records speak of 'Aumriel', a mysterious figure Ysgramor's heirs battled for decades, and finally sealed away." This page was last modified on 19 November 2018, at 04:24.